1790: son of Segawa Raizô and grandson of Segawa Kikusaburô I, he made his debut in Ôsaka, where he performed under the name of Segawa Kikusaburô II. 1795 ~ 1797: he settled in Edo and was adopted by Segawa Kikunojô III. 1st lunar month of 1798: premiere at the Kiriza (Edo) of Namiki Gohei I's play "Tomioka Koi no Yamabiraki", commonly called "Ninin Shinbê"; Kikusaburô played the role of Oume [casting]. 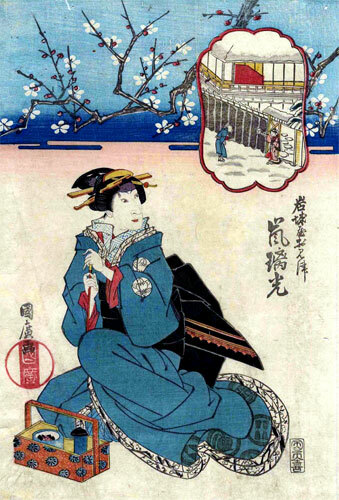 2nd lunar month of 1800: Namiki Gohei's drama "Gosan no Kiri" was staged for the first time in Edo, at the Ichimuraza in a somewhat different version titled "Sanmon Gosan no Kiri" instead of "Kinmon Gosan no Kiri"; Kikusaburô played the role of the courtesan Hanatachibana [casting]. 8th lunar month of 1801: first grand shûmei for the Hamamuraya guild, at the Ichimuraza; Segawa Kikunojô III, Segawa Kikunosuke, Segawa Kikusaburô II and Segawa Matsunosuke respectively took the names of Segawa Rokô III, Segawa Michinosuke I, Segawa Michisaburô I and Segawa Hamajirô. They play together in the drama "Dôjima Tamino no Tsumikomi". 8th lunar month of 1803: premiere at the Nakamuraza of Sakurada Jisuke I's drama "Banzui Chôbê Shôjin Manaita"; Michisaburô played the role of Matahei's wife Ohama [casting]. 1st lunar month of 1808: he took the name of Takinaka Utagawa. 11th lunar month of 1808: Takinaka Utagawa took the name of Nakamura Rikô II at the Ichimuraza, performing in the kaomise drama "Irosoyuru Nidai Genji", which welcomed in Edo the Kamigata actor Sawamura Tanosuke II. 3rd lunar month of 1818: Rikô played at the Moritaza the roles of Ofude and Enju in the drama"Hirakana Seisuiki". 1818: Rikô went back to Kamigata, where he became disciple of Arashi Kichisaburô II. 1st lunar month of 1819: he took the name of Arashi Rikô I in Ôsaka at the Naka no Shibai, performing in the new year drama "Keisei Miyako Meguri". 6th lunar month of 1821: Katsu Hyôzô I's drama "Kachi Zumô Ukina no Hanabure", commonly called "Shirafuji Genta", was revived for the first time, 11 years and 3 months after its premiere in Edo, in Kyôto at the Kitagawa no Shibai; Rikô played the role of Osawa's sister Otomi [casting]. 1st lunar month of 1830: Rikô's rank in the Kamigata hyôbanki, wakaonnagata section, was jô-jô-kichi (superior - superior - excellent) [visual]. 1st lunar month of 1836: Rikô settled in Edo and performed at the Nakamuraza in the new year drama "Waka Ebisu Soga no Minato"; he quickly went back to Ôsaka. 10th lunar month of 1836: Rikô played in Ôsaka at the Kita no Shinchi Shibai in "Mai Ôgi" and "Gosho Zakura Horikawa no Youchi". 1st lunar month of 1838: Rikô played at the Naka no Shibai the role of Oishi in the classic "Kanadehon Chûshingura". 26th day of the 9th lunar month of 1839 : Rikô died in Ôsaka. Arashi Rikô I was a talented and popular onnagata actor. Born in Kamigata, trained in Edo, he finally achieved fame for himself in Kamigata, where he reached the prestigious jô-jô-kichi in 1830 and held this rank for 10 years. He excelled in okugata and nakai roles. He was an outstanding fukeoyama in his latter years. The 26th day of the 9th lunar month of the 10th year of the Tenpô era was the 1st of November 1839 in the western calendar.